The Greek gods and goddesses live! 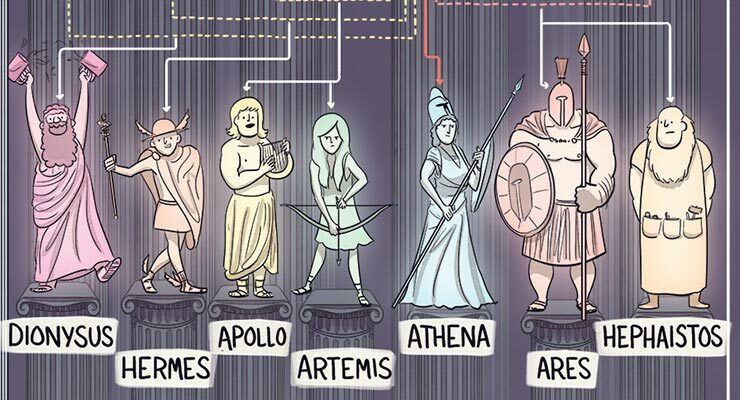 Check out this awesome cartoon family tree that depicts the family relations of Zeus, Hera, Apollo, Hermes, Athena, Hestia and all the rest! Like many of the early pagan gods (particularly the Egyptian gods, from who they may have drawn significant inspiration, as Greek culture was inspired by the earlier Egyptian civilization, which was in turn inspired by the Sumerian, Mesopotamian and Babylonian civulizations), the Greek gods and goddesses were represented as a large, squabbling family structure. Thought to all live on Mount Olympus, a mythological mountain perhaps analogous to our modern conception of heaven, the Greek gods and goddesses were constantly involved in drama, backbiting and other petty social squabbles. But there was often nothing petty about them: The Greek gods and goddesses could be fearsome, wielding the power of life and death over mere mortals and often bending them to their whim, or using mortals as playthings. This, at least, was how the ancient Greeks explained the often confusing and arbitrary-seeming events of existence. The Greek gods were, of course, later adopted by the Roman empire, who re-skinned them and gave them Latin names (with Hermes becoming Mercury, Zeus becoming Jupiter or Io Pater, and so on). As the Roman gods, they formed the backdrop of the birth of Christianity, and St. Paul preached against both the Greek and Roman gods as he proselytized throughout the Mediterranean region during the first century AD. While his followers were initially persecuted in both Greece and Rome, Christianity eventually won out against the pagan gods, with Greece becoming the hub of Orthodox Christianity and Rome becoming the center of the Roman Catholic Church. The awesome family tree of the Greek gods and goddesses below is a great introduction to the gods and their interrelationships. Oh and by the way—if you’re interested in learning how to talk to the gods yourself (yes, it is possible, even if they just represent archetypes in the unconscious mind), check out Ultraculture’s free course on chaos magick. You’ll learn everything you need to master the basic skills necessary to interact with godforms—and you’ll easily be able to apply it to invoking the Greek gods once you learn the basics.